So I had decided I was going to try to start daily outfit posts. Then I broke down in helpless laughter after I remembered that I have a baby and a full-time job and my mornings are an ocean of chaos. So I think instead what I'm going to try to do is collect photos of my outfits during the week and post them on the weekend. This week will be truncated, because I didn't come up with this idea until Wednesday, and I sort of forgot to actually take any photos until Thursday. My feelings about this outfit are mixed. It looked good in my mirror, but I can see in this picture I kind of had a droopy-drawers thing going on with these pants -- they were sagging down all day, which really ruined the look. I was happy with the last-minute addition of the cardigan - I love blue and red together, and I felt like it made it look a bit more professional (this is a touch more casual than I usually dress for work). I feel like I am channelling Zo in this photo. Sorry for the blurriness - I am still working on my auto-timer settings. Consider this a trial run. With it being "casual Friday" at work, I felt I could get away with this. 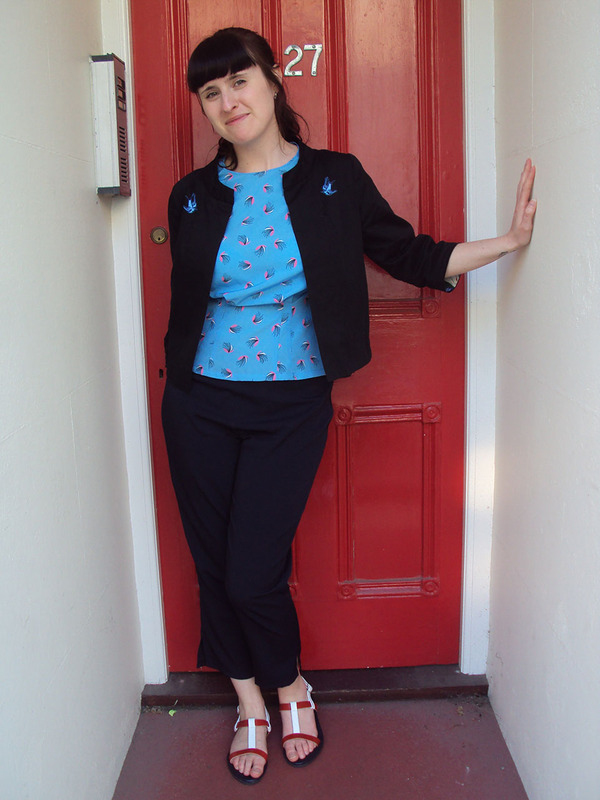 I have worn various versions of this ensemble before, but I really like the slim-fitting capris and slip-on shoes with this top for a retro feel. It is comfy and easy-going, but I still felt cute and chic. In retrospect, some accessories would have helped dress it up a bit for the office, but the baby was screaming all morning while I was getting ready, so I didn't really have time to contemplate my options.